(Photo: REUTERS / James Akena)Displaced families are seen camped inside Tomping U.N. base near Juba international airport December 24, 2013. ADDIS ABABA, May 1 (Reuters) - The conflict in South Sudan could descend into genocide, U.S. Secretary of State John Kerry warned on Thursday as he renewed threats of sanctions and raised hope that more peacekeeping forces could be deployed swiftly to halt the bloodshed. Kerry, emerging from talks about the increasingly ethnic slaughter in South Sudan with foreign ministers from neighboring Ethiopia, Uganda and Kenya, said all sides agreed the "killing must stop". "A legitimate force that has an ability to help make peace needs to get on the ground as rapidly as possible," Kerry said in Addis Ababa at the start of an African trip. Addressing reporters later, Kerry said the goal was that "in these next days, literally, we can move more rapidly to put people on the ground who could begin to make a difference." Ethiopian Foreign Minister Tedros Adhanom said all sides stressed the need for deployment of a force "as soon as possible." A spokeswoman said Kerry was referring to regional forces under the authority of the United Nations which already has a mission in South Sudan. Kerry said he and his African counterparts agreed on "the terms and timing and manner and size" of such a force but declined to offer details. "The greatest single difference will be moving rapidly with U.N. Security Council imprimatur of support to get forces on the ground who could begin to separate people and provide safety and security. That's imperative," he told reporters. The U.N. Security Council on Dec. 24 approved a proposal to nearly double the strength of the U.N. mission in South Sudan, known as UNMISS, to 12,500 troops and 1,323 police from its previous size of 7,000 troops and 900 police. But fewer than half of those additional peacekeepers have arrived. They are to be drawn from nearby U.N. and African Union missions in the Democratic Republic of Congo, Ivory Coast, Liberia, and the Sudanese regions of Darfur and Abyei. The Security Council is planning to discuss the South Sudan conflict on Friday, U.N. diplomats said. Members of the 15-nation body are already considering the possibility of U.N. sanctions on South Sudan's warring parties. 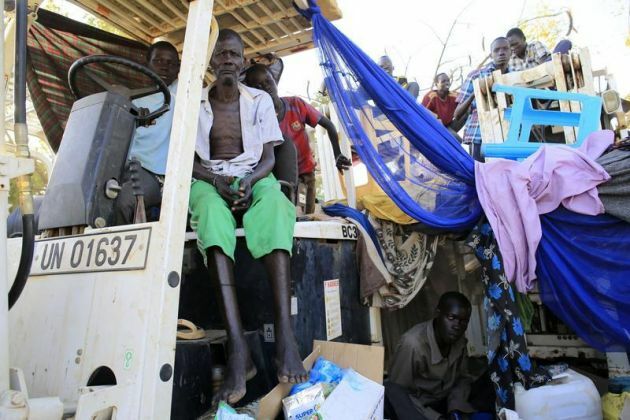 More than 1 million people have fled their homes and thousands have been killed since fighting erupted in the oil-producing country in December between troops backing President Salva Kiir and soldiers loyal to his sacked deputy, Riek Machar. Negotiations between the Kiir government and rebels loyal to Machar have failed to advance since the Jan. 23 signing of a ceasefire that never took hold in the world's newest country. Asked about the risk of genocide, Kerry said "very disturbing, leading indicators of the kind of ethnic, tribal, targeted nationalistic killings" raised troubling questions. "Were they to continue in the way that they have been going (they) could really present a very serious challenge to the international community with respect to the question of genocide," he told reporters without elaborating. The fighting has exacerbated ethnic tensions between Kiir's Dinka people and Machar's Nuer. Kerry lamented violence on both sides and called upon Kiir and Machar to publicly "condemn the brutal attacks that are taking place against innocent people." Delegations from two sides of the South Sudan conflict resumed face-to-face discussions in Addis Ababa on Thursday after several delays, officials said. A senior State Department official, speaking to reporters traveling with Kerry ahead of the trip, said regional powers were losing patience with the inability of the two sides in South Sudan to move forward with peace efforts. "I think both sides think that they can win this militarily, and they have certainly not participated in any committed way to finding a negotiated settlement for the conflict," the official said, speaking on condition of anonymity. Kerry renewed U.S. threats of sanctions and said regional partners Uganda, Kenya and Ethiopia "accepted the responsibility for also doing sanctions." Many South Sudanese own property in the three neighboring countries and regularly travel there, the State Department official said. President Barack Obama last month authorized possible targeted sanctions against those committing human rights abuses in South Sudan or undermining democracy and obstructing the peace process. Still, Kerry held out hope that talks might sway the course of events in South Sudan, and pointed to Kiir's decision last week to release four political prisoners. "We are hoping that now opens up the possibility of a mediation and dialogue that could take place anywhere in the next few days," he said.